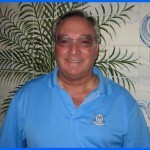 Old Palm Golf Club | Old Palm News - Lee Bladen’s Turf Talk: Everything is Wonderful! Lee Bladen’s Turf Talk: Everything is Wonderful! Everything is Wonderful! By Lee Bladen Old Palm Golf Course Superintendent Things have been going as planned and we wanted to update you on our greens renovation project. It has been a great grow-in. The weather has been perfect, hot and sunny, and we haven't had any weather events that have hurt us or slowed us up. As a result we have been able to stay right on schedule with our watering, fertilizer applications, and topdressing. The first set of greens, Practice holes 1, 2, and 3, nursery green and small chipping green at the north end of the driving range are now 10 weeks old. These greens are being mowed regularly at a cutting height of 115 thousands of an inch. Dried bagged sand is applied twice a week as topdressing. The putting surfaces are smoothing out very nicely. It won't be long before they will be ready for play. The next set of greens, the putting green and chipping green at the studio, the small practice green at #1 tee, and holes 1-6, 9, 15 and 17 are 4 weeks old. These greens are now about 90% covered with the TifEagle bermudagrass. Watering has been greatly reduced as we have past the grass establishment phase and are now in the grass growing phase. Heavy topdressing is being applied weekly using the same sand mixture the greens were constructed with. In an effort to really stimulate growth, fertilizing is done at a rate of 1 pound of nitrogen per 1000 square feet every three days. Mowing heights are now around 145 thousands of an inch and are being lowered every few days. Rapid lateral growth is allowing us to lower the cutting heights to accomplish two things. First it forces the grass to creep sideways filling in any bare areas. It also scalps the grass plant thus smoothing out some of the high spots. Great growing conditions are making it much easier to be aggressive with our grow-in and this will eventually give us a lot of time to get them ready for play. On July 4th and July 7th we grassed the last eleven greens. Greens 7, 8, the putting green at #10 tee, 10, 11, 12, 13, 14, 16, 18, and 19 are now 3 weeks old. They are progressing nicely and are about 40% covered. Rolling, applying lots of water and fertilizer are really pushing the TifEagle on these greens and they are filling in very nicely. Our first mowing has been done at 200 thousands of an inch and will be shortened by 5 thousands each upcoming cut. During the construction of the greens we went about 5 to 7 feet outside the putting surface to make sure everything blended together so the transitions from old to new were smooth. All hands are on deck rolling, and sanding these tie-ins to make them look like things fit. The heavy topdressing will allow the chipping areas to be firmer. We will then have the ability to cut our collars and approaches shorter so that the paspalum is more forgiving around the greens.